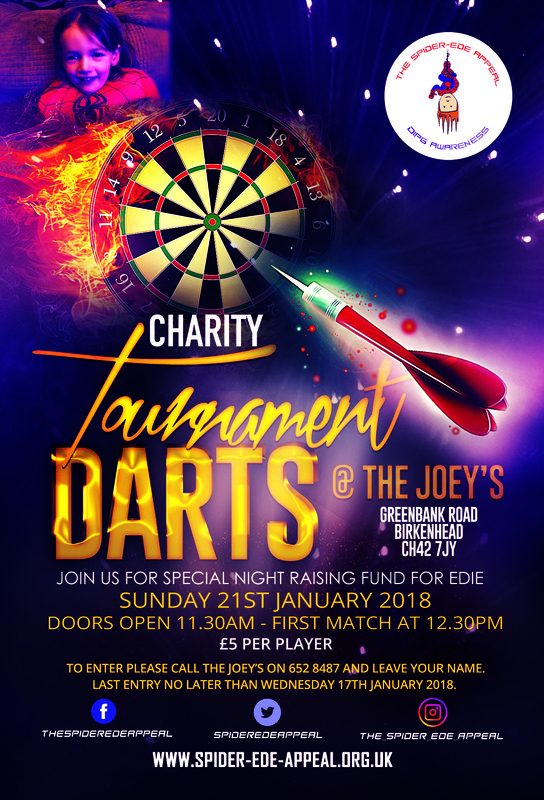 On Sunday 21st January there will be a darts tournament held at The Joey’s (St. Joseph’s Centre) in aid of the Spider-Ede Appeal. There will be a £5 entry fee and money raised will go towards helping Edie May to get to Monterrey for the treatment that she desperately needs. There will be raffles and other fund-raising activities going on throughout the day, with some truly fabulous prizes that have been donated by the amazing businesses and members of the community who are supporting Edie. Please share this and support us on the day if you can. Sunday, January 21, 2018; Doors open at 11:30AM (12:30PM first match). To enter please call The Joeys on (0151) 652 8487 and leave your name. The deadline for entries is Wednesday, January 17, 2018. We have no events planned at present. To view our full calendar of upcoming events, visit our Upcoming Events page. The staff and parents at Edie’s nursery Park Wood Private Day Nursery and Forest School have been so supportive of our family this last year.🙏 We received this photo of some of Edie’s lovely nursery teachers. Each of the staff at nursery have personally gone out and bought 2 extra presents whilst doing their Christmas shopping, one for Niamh and one for Len ❤️💙 Every time we take Len into nursery we get to see a beautiful memorial for Edie outside, set up by the staff and children, including Edie’s friends👭👬 They have a memory book inside the hallway and anyone attending Park Wood can write in there. We regularly stop to look through the pages, so please keep leaving us little notes. Thanks to little things like this we have faith our girl will never be forgotten 🌟 Park wood, along with Niamh’s school, our friends and family have all gone above and beyond to help us get through this time of year. More than we would ever have expected 🙏🙏 Thank you all so much, this has taken great pressure off us and we haven’t had to think about Christmas too much. Please note that as an Amazon Associate I earn from qualifying purchases.